Storey Publishing, LLC, 9781580176804, 240pp. Embrace the jewel-toned fruits, flaming foliage, and woody plants of the fall garden. 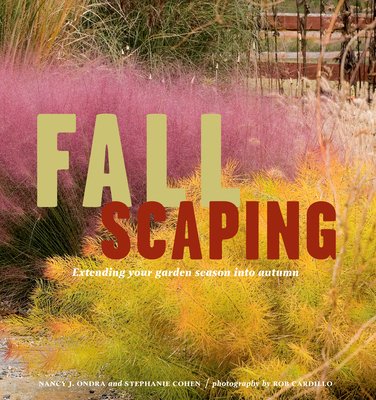 Landscape designers Nancy J. Ondra and Stephanie Cohen offer practical design ideas, plant advice, and 10 complete garden plans in this autumnal gardening guide. Ondra and Cohen’s expertise is complemented by stunning color photographs that illustrate the beauty and variety of this often overlooked gardening season. You’ll be inspired to use vines, tree shrubs, and flowers to contribute color, texture, and beauty to your garden well past summer’s peak. Nancy J. Ondra, author of Container Theme Gardens, is a garden writer and editor as well as the former owner and operator of a small rare-plant nursery. She is the author or co-author of a dozen gardening books, including Foliage (winner of the 2008 Book Award from the American Horticultural Society), The Perennial Gardener’s Design Primer (winner of a 2006 Silver Award from the Garden Writers Association), Five-Plant Gardens, The Perennial Care Manual, Fallscaping, and Grasses. She currently gardens in Bucks County, Pennsylvania, and blogs at www.hayefield.com. Stephanie Cohen, “The Perennial Diva,” has received awards from the Philadelphia Horticulture Society, was elected a fellow of the Garden Writer’s of America, and was named a Garden Communicator of the Year by American Nursery and Landscape Association. Cohen founded the aboredum at Temple University and served as the director for five years. She has written for Country Living Gardener, Blooms of Bressingham Perennial Program, American Beauties Program, The Pennsylvania Horticultural Magazine, Organic Gardening, Fine Gardening, and Green Profit. Rob Cardillo has been photographing gardens, plants, and the people who tend them for more than 20 years. A former director of photography at Organic Gardening, he now works for publishers, horticultural suppliers, and landscape designers throughout the United States. Visit him at www.robcardillo.com. "Nancy J. Ondra and Stephanie Cohen have found an easy, breezy way to convey fun, fresh ideas."